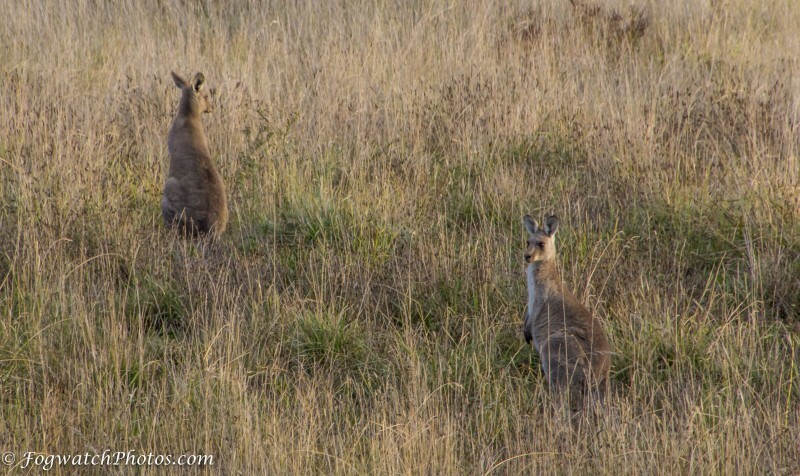 You could walk straight past a couple of kangaroos and never know they were there – perfectly camouflaged! I’m a bit suspicious of kangaroos wearing camouflage – they might be up to something. But what struck me about the scene, was how they led the eye up the hill, even though one was looking out of the picture. So what is going on here to make the image dynamic? The darker green tufts of grass set up a diagonal across the image from lower right to upper left. Whenever there are two subjects, the eye forms a relationship between them, which in this case leads the eye from one kangaroo to the other – again lower right to upper left. But why that direction, and not from upper left to lower right? The answer lies in the gaze of the lower right kangaroo looking past the observer towards the left. The shape of the body takes you up that same powerful diagonal to the second ‘roo which has its back to us and is looking to the right. The two kangaroos are approximately one third in from each side, and the lighter colour bands frame the image. And here’s where it gets interesting. Our eyes are drawn first to the eyes of the lower roo, but then they are drawn up the diagonal to the upper left – where that kangaroo is looking to the right, so our eye is drawn back to the lower right in a kind of vortex that belies the tranquility of the scene. This adds to the sense of alert-ness of the roos and makes for a compelling image. How do you photograph quilts? Susan Morris on How do you photograph quilts?